I’ve watched Shahid thrice; the last time, I even paid to see it! What can I say about Shahid that hasn’t been said already and by many, far more eloquently than me? This time around I had half my attention on the reaction of the audience as well. They laughed when I did and cried when I was weeping copious tears (I promise I heard many sniffles during some overwhelming moments in the film). At the end of the film, we all cheered for our 2 hours well spent and worth every rupee! I must admit rather candidly that I am guilty; of the same prejudices that most of the population of this country have towards Muslims. However, when I was watching Shahid, I forgot about his religion or his faith and could only focus on his zeal. What made Shahid tick? How did this young man so full of life and such goodness, deal with all the adversities in his life? The answer is simple. Shahid Azmi was a man of choices. Even the wrong choices made by him, he endeavoured to rectify. 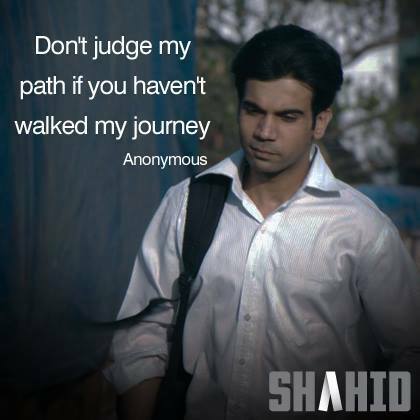 At every crucial juncture in his life, Shahid chose to listen to his instincts and heart. This man of internal steel weathered every storm in his life stoically and in a matter of fact manner, that warms the cockles of the heart. He never bragged about his achievements nor cursed fate for his problems. This country needs more people like him who turn to education to beat jingoism and the system rather than beat up the people. Hansal Mehta has proved his worth by rising from the ashes like a Phoenix. By showcasing and with such skillful accuracy as well as sensitivity, the life of Shahid Azmi, a lawyer who was mercilessly killed for helping innocent convicts, he has shown one and all, the depth of his capability and evolution. From raw intensity, emotions, subtle humour and Shahid’s passionate belief in righting the wrong, Hansal has drawn out nothing short of natural and perhaps some of their best performances from his cast and crew. There are some actors who define the roles they play so strongly that audiences find it unimaginable that another could have played it better. Raj Kumar Yadav, the unconventionally attractive actor lived and breathed the life of Shahid and infused a freshness that was very refreshing in the way the story was told. So convincing was his performance that he had me crying and laughing in the film. This multi-talented and gifted actor will go a long, long way! In all this, due accolades must be given to the ENTIRE crew and cast of Shahid without whom this success would not have been possible. Baljinder Kaur, Mohammed Zeeshan Ayyub, Prabhleen Sandhu, Kay Kay Menon, Vipin Sharma, Shalini Vatsa, Yusuf Husain and many more, complemented and enhanced this labour of love with their contribution and presence. Sameer Gautam Singh has expertly woven an excellent and well researched story. He painted it lovingly with myriad emotions and some unforgettable moments which had me spell bound! No story is every complete without the contribution of the Editor. Apurva Asrani’s crisp and ever definitive cutting edge style leaves us with a visual delight beyond words. Precise and beautifully timed, this brilliant and talented Apurva has contributed greatly to the success of Shahid by also Co-writing the screenplay along with Hansal Mehta. No one tells a story with such purity as this award winning Editor! Mercifully, this movie was devoid of raucous and idiotic songs. The music by Karan Kulkarni resonates hauntingly in the mind long after you leave the cinema hall. Anuj Dhawan’s cinematography is truly gasp-worthy. The capturing of iconic streets by day and night, opening credits of the film are only some of the many good scenes captured on celluloid by this bright professional. SHAHID IS NOT A 100 CR FILM; IT IS PRICELESS!